Keynote address (G. Haerendel). Session I: Regional Developments (I). ROCSAT program and some related research topics (J.M.Shyu). An introduction to the KITSAT program and the activities at the Satrec in Korea (S.-D. Choi, B.J. Kim and E.-E. Kim). Microsatellite's R&D activity in Japan (A. Nakajima). Session II: Regional Developments (II). Russian small satellites and means to launch (M.Y. Ovchinnikov). The Irish and other European space initiatives (S.M.P. McKenna-Lawlor). Outline of the whale ecology observation satellite system (T. Hayashi, S. Hosokawa, H. Tomita). Session III: Lesson Learned (I). ASTRID-2: An advanced auroral microprobe (L.G. Blomberg et al.). An overview of the Korea multi-purpose satellite (KOMPSAT) (B.K. Kim). Space radiation experiments on KITSAT-1 and KITSAT-2 (K.W. Min et al.). Space at Surrey: Microsatellites & minisatellites for affordable access to space (M.N. Sweeting). Session IV: Lesson Learned (II). Microsatellite experiences from the United Kingdom (D.S. Hall). ØRSTED - A Danish microsatellite with a high scientific profile (E. Friis-Christensen). New technologies for miniaturized spacecraft and multi-point cluster missions (E.L. Reynolds, M.K. Flaherty). Lessons learned? (W.H. Ip). Session V: Innovations (I). Advanced microsat technology (Y. Matsumura, T. Iwata). The conceptual system design of the users spacecraft (K. Ijichi et al.). An attitude control system design based on the Turksat-1b geostationary satellite (O. Tekinalp, Ö. Uslu, Y. Tulunay). 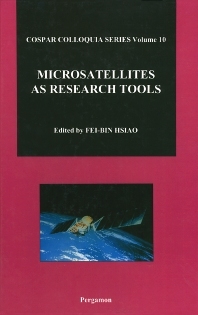 Microsatellites power supply systems, peculiarities and methodology of designing (Y.N. Agafonov et al.). Microaccelerometric satellite MIMOSA (Micro-Measurement of Satellite Accelerations) (L. Sehnal, R. Peresty, P. Dostál). Poster Session I: ROCSAT-1 Program, NSPO, Taiwan. An overview of ROCSAT-1 electrical ground support equipment design (J. Wu). Multilayer insulation for spacecraft applications (C.-S. Kang). Attitude determination and control system for a small LEO satellite (Y.-W. Jan, L.H. Ting). An overview of ROCSAT-1 OCI science team and science data distribution center (H.-W. Li et al.). Session VI: Innovations (II). Power propulsion and communications for microspacecraft missions (W.A. de Groot, T.M. Maloney, M.J. Vanderaar). Propulsion options for primary thrust and attitude control of microspacecraft (W.A. de Groot). Comparison of magnetic and aerodynamic stabilization for a microsatellite (Z.-C. Hong et al.). Session VII: Scientific Applications (I). Planetary atmospheric microprobes (B. Hausler). Characteristics of the MOMPSAT-I Payloads and its applications (H.Y. Paik et al.). Telemedicine using small satellite MEO/HICAT for international medical communications (I. Nakajima et al.). Session VIII: Scientific Applications (II). A global view of the magnetosphere using microsatellites (A.D. Johnstone). The use of microsatellites in monitoring the ionosphere/plasmasphere (E.A. Essex et al.). A microsatellite imaging mission for the multi-phase-angle investigation of vegetation (K. Briess et al.). A study on Ka band rain attenuation for LEO satellite over Taiwan area (Y.-H. Chu, S.-P. Shih). Session IX: Scientific Applications (III). The humble space telescope: the accommodation of a small astronomical telescope on the Minisil bus (A.J. Barrington-Brown et al.). Poster Session II: General. A computer based system for on-ground testing of the attitude control system of small satellites (V. Alexandrov et al.). Positioning system using low earth orbit constellations (D.-M. Ming Ma, S.-Y. Zhai, H.-E. Shen). Analysis the unsteady-state temperature distribution of microsatellite under stabilization effects (S.R. Lee et al.). Robust performance design to satellite attitude control (C.-D. Yang, Y.-P. Sun, C.-Y. Chang). An EUV spectrometer for monitoring the aurora (R. Stalio, A. Lyle Broadfoot). Session X: Education. A student satellite project (K.C. Hsieh, C.A. Lewicki). Munin: A student nanosatellite for space weather information (O. Norberg et al.). SEDSAT-1 lessons learned (M.W. Maier, S.T. Wu). The student explorer demonstration initiative project (J.R. Sevier, P.J. Coleman, Jr.). Author index. In order to reflect the increasing importance and interest of the microsatellites in high technology and scientific applications in space, the Colloquium on Microsatellites as Research Tools was organized to promote its usage and technology development and to foster the international cooperation, especially in the area of the Asia pacific region. Attended by 150 participants from 18 countries the colloquium was organized into five major themes: regional development, lessons learned, innovations, scientific applications, and education. A special session was organized as well by the organizing committee and supported by the National Space Program Office to present its development of the Taiwan's satellite program and the current status of ROCSAT-1 which is scheduled to be launched at the beginning of 1999. Two main conclusions were drawn from the material presented: microsatellite in general is a very good means for doing space research and technology development, and a suitable vehicle to promote international collaborations.